1 x Thompson Speedtouch 563 1 Port Modem/Router. 1 x Grey ADSL Cable (This will be what you connect from your microfilter to grey port on the back of your Speedtouch device). phone into the filters Phone Socket . 3) Using the supplied grey phone cable connect one end to the DSL port on Speedtouch Router to the DSL socket on your ADSL Filter. a) Using the supplied blue USB Cable connect the square end to the back of the Speedtouch Router. 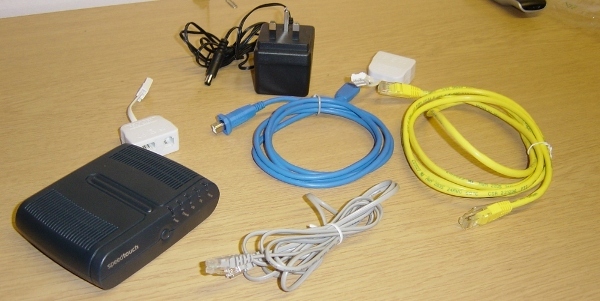 b) Using the supplied Yellow Ethernet Cable, connect port 1 of your Speedtouch Router to the network LAN Connection of your PC. 5) Plug in the Mains Power adapter to the Speedtouch Router and the other end to a Mains Outlet. Place the provided CD into your computers CD Drive. This should run automatically. 3) You should now see a screen that is telling you that the driver is installing. select Quit and plug in the USB cable that you attached earlier from the modem to a spare USB port on your PC. 5) You should see the yellow balloon telling you it’s found a USB Device and that it’s a Speedtouch Modem it has detected. This should disappear on its own after a few moments. 6) Follow the instructions below from Steps1 to Step 6. One you have compelted this you should then be online. of your connection by doing the following. 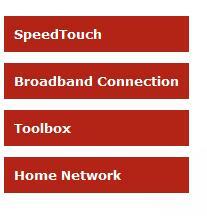 1) Select Broadband Connection from the left hand menu like the one shown below. 2) It will ask you then to enter in your Suffolk Online Username & Password, then select Connect over on the right hand side. These will be in the letter that was sent to you. If you still need this please contact the Support Desk. The Remember Password box should already be ticked if not please tick this. Below where you entered your broadband username and password. 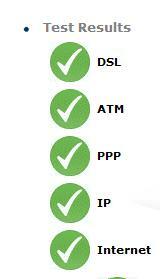 4) Once you have select like in the picture above you should see the following screen. Leave the service to Internet and click on Check Connectivity. 5) Once this has been completed and if everything has been entered in correctly you use should see the following screen.